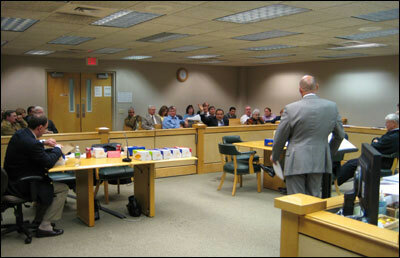 Partner Paul Rice has lead the Volusia County Bar Association’s family and divorce lawyers for five years. 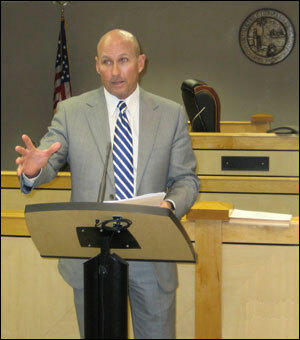 Partner Paul Rice, seen here chairing the Family Law Section’s February 5, 2009 meeting, has lead the Volusia County Bar Association’s family and divorce lawyers for five years. After serving as the Bar Association’s President for the 2001-2002 year, Mr. Rice assumed the role of Chair for the Family Law Section. The Section meets two to three times per year and is attended by the county’s family law judges, the chief court administrator, family court administrator, general magistrates, other various court service personnel and, of course, the local divorce and family law attorneys. The chief topic, among others, was the Florida Legislature’s major overhaul of Florida Statute §61.13 dealing with the care, custody and control of minor children. In particular, the Legislature deleted any reference to custody or primary residence opting to describe the parents’ relationship to the children in terms of parenting plans and time sharing arrangements. No longer will one parent be named “king or queen” as it relates to the children. The underlying purpose of these statutory amendments was to avoid caustic and expensive custody battles. Mr. Rice is board certified by the Florida Bar in divorce and family law. He recently attended the Florida Bar Family Law Section’s annual two day Board Certification Review Seminar, which was held on January 22nd and 23rd of 2009 at Disney’s Grand Florida Resort in Orlando Florida.